When you stay at Pierre & Vacances - Résidence Premium & Spa Houlgate in Houlgate, you'll be next to a golf course and convenient to Houlgate Tourist Information Center and Houlgate Beach. 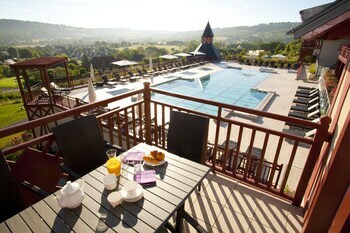 This 4-star residence is within close proximity of Halles Medievales and Chruch of Notre-Dame. Make yourself at home in one of the 126 guestrooms, featuring kitchenettes with refrigerators and microwaves. Rooms have private furnished balconies or patios. Complimentary wireless Internet access keeps you connected, and flat-screen televisions are provided for your entertainment. 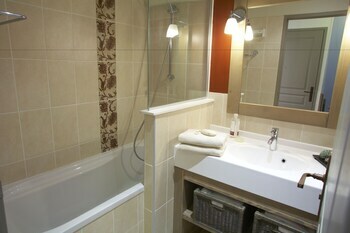 Conveniences include phones, as well as coffee/tea makers and blackout drapes/curtains. Relax at the full-service spa, where you can enjoy body treatments and facials. 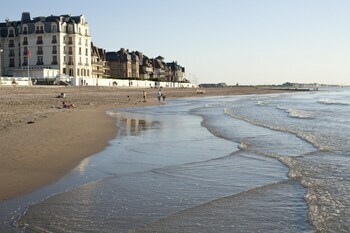 Pierre & Vacances Residence Premium & Spa Houlgate is an ideal Houlgate lodging choice for your trip to France. 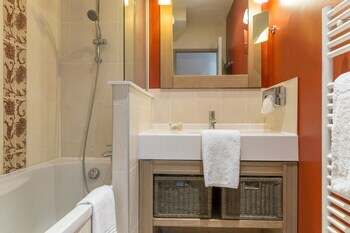 With numerous amenities for guests such as laundry, you will wake up at Pierre & Vacances Residence Premium & Spa Houlgate feeling excited every day for your time in Houlgate. Don’t let this amazing reservation opportunity pass you by, book your stay at Pierre & Vacances Residence Premium & Spa Houlgate today to make the most of your time in Houlgate, France.